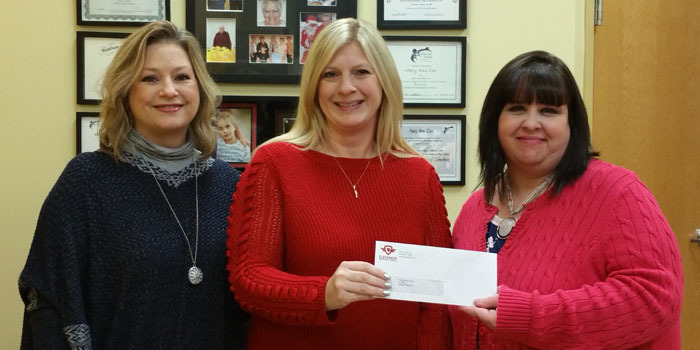 Pictured from left are Andrea Sands, Clevenger Insurance; Jennifer Hayes, executive director of The Beaman Home; and Jody Arnett, Clevenger Insurance. WARSAW — Through a referral program, Clevenger Insurance donates $10 toward a local recommended charity. With these funds, they accumulated and donated $250 to the Beaman Home’s general fund. With these funds, Clevenger Insurance is helping to ensure traumatized domestic violence victims and their children have a safe place to flee from their abuser, hot meals served three times daily, and the essentials necessary to live. Thanks to Clevenger Insurance, along with the generous community, the Beaman Home is able to provide not only emergency shelter, but also outreach services necessary for those who have been abused in the past to continue their lives free of violence. These services include, but are not limited to, professional counseling and group therapy. All services are free of charge.